Conference season is kicking off. Is your conference content ready for prime time? From a content marketing perspective, major industry conferences are attention magnets because they laser-focus your target audience on the key topics. As a result, the major conferences are content generation and distribution opportunities requiring less work and budget to break through. Even better, conference attendees are physically present in one location and following the show’s hashtag on social media. Further, they’re predisposed to acquire as much information as possible! More importantly, conferences are ALL about business. But, to create quality conference content, you need a content marketing plan and related editorial calendar regardless of whether you’re a conference producer, presenter, sponsor, attendee or outside spectator. Otherwise—no conference content magic happens! 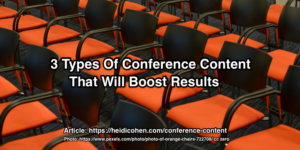 Don’t worry, we’ve got you covered–here are the 3 types of conference content that you need to boost your marketing results. Since conferences are audience attention magnets, include related content creation and promotion around these major events. Make conference content part of your content marketing plan and budget to take advantage of this topic-related interest. At a minimum go through the conference agenda. Develop a plan before you get to the event! Have you created conference content in the past? If so: How did it perform? Is it still relevant? Can it be updated and improved? What gaps did you leave? Where are opportunities for your content to stand out and shine? What hook will you use to attract and keep attention? Assess what you and the competition did at past conferences. Pre-conference content focuses on building attention and excitement for the event. 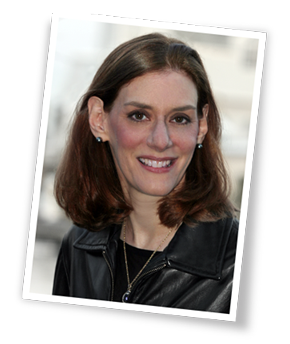 It’s best done over time where special details such as keynote speakers are revealed to boost interest. Generating sales in terms of attendee fees and sponsorships. Building excitement over special keynotes and breakout sessions as well as attendees. Every speaker wants to have a sold-out session to create thought leadership and generate business leads. Similarly sponsors want to connect with attendees to drive warm leads. Take advantage of the category interest to distribute content and build relationships. This helps to amplify conference attention during the show since the hashtag has been used over time and remained visible. TwitterChats. Take a page from the conference experts at Content Marketing Institute. 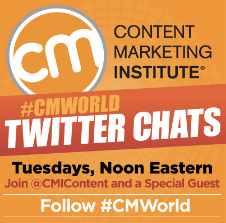 They run an on-going discussion and weekly Twitter Chat at #CMWorld . The #CMWorld chat has a different guest every week. Even better, they create a blog post summary of many of the chats. Here’s an example with Allen Gannett. 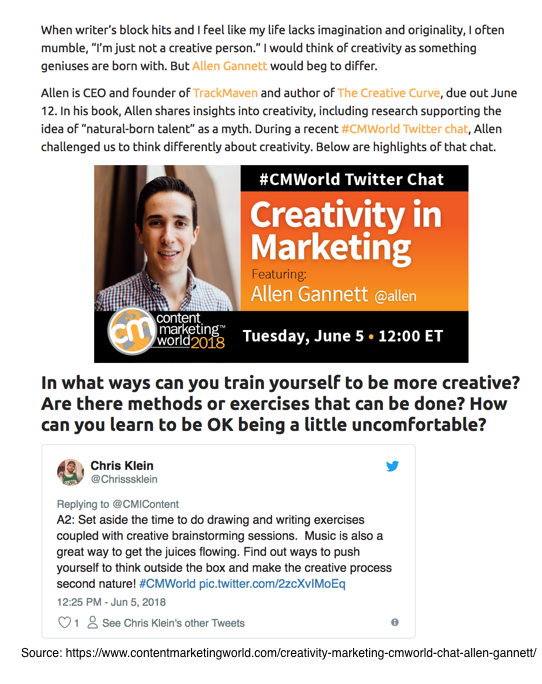 Write up from #CMWorld chat. It’s a great way to extend your content. Facebook and LinkedIn Groups. This approach is increasingly popular and the community can be very helpful. It’s also a great way to keep attendees engaged after the event. Even better it often acts like a Mastermind as the Heroic Public Speaking Facebook Group does. Depending on the conference, consider going niche. For example, Social Media Examiner created a Facebook Group solely for their speakers. 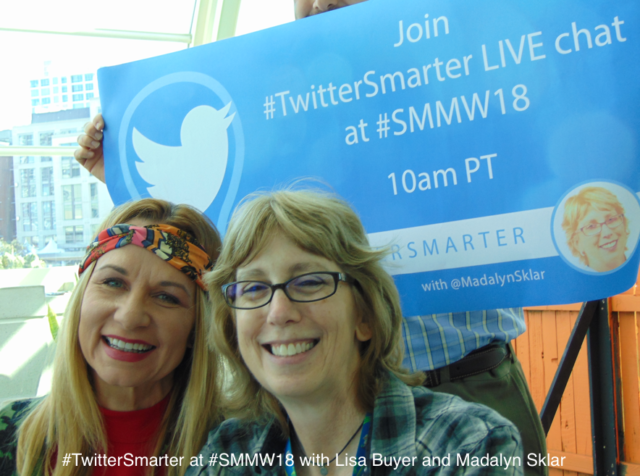 Even attendees can develop their own Facebook Group as Nadya Khoja and Susan Moeller did with their Women In Content Marketing. Top Rank’s Lee Odden and his team wrote the epic conference playbook with their curated ebooks. 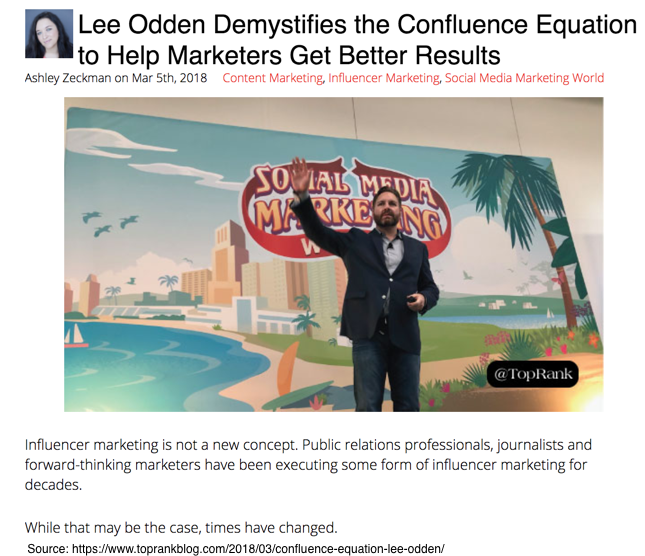 For Content Marketing World, Odden and his team reach out to presenters and ask them specific questions. The team compiles this information and creates an ebook. They also reach out to contributors to share the content with pre-formatted social media shares. 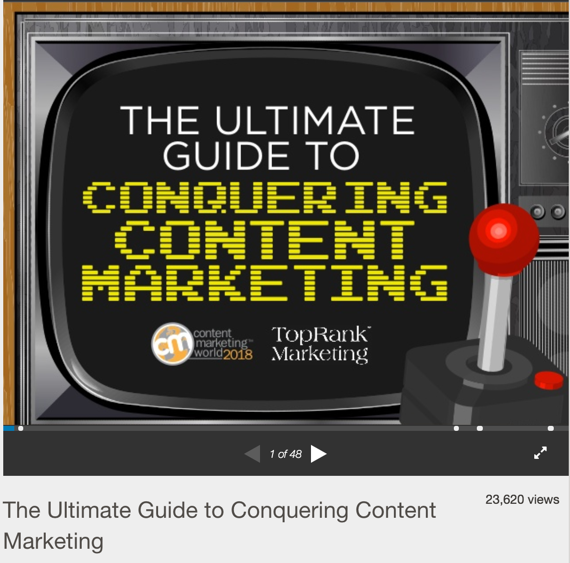 BTW: Their 2014 Content Marketing World ebook series won a MarketingProfs’s Bright Bulb award for the campaign. The key to pre-conference content success with crowd pleaser content is name dropping. The more people that you get involved the better your results. You can ask one speaker or a panel of speakers to answer a set of questions. Alternatively, you can use data to select the people you spotlight. 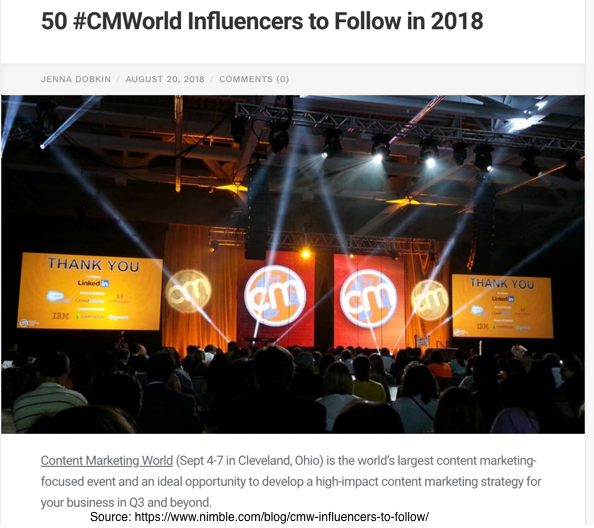 Here’s an example from Nimble for Content Marketing World 2018. To create conference content on the fly, you must be prepared! As a result, your conference content plan is key. Many speakers imbed pithy sharable content in their presentations. You can even spotlight the fact to your audience with verbal and visual hints as Doug Kessler did with this slide. You can also enhance your presentation with shortened URLs and/or pre-schedule social shares during your presentation to help attendees and others follow your talk. Kelly Kingman of KingmanInk is the go-to visual note taking expert. 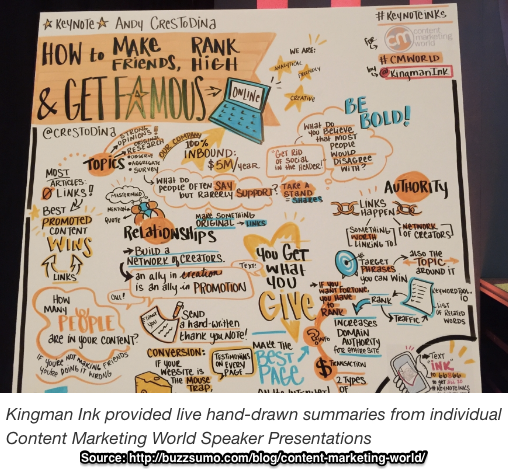 Kingman creates visual notes for Content Marketing World and MarketingProfs B2B. The results become social media eye-candy that attendees snap and share. The Top Rank team are live-blogging experts. They plan the sessions that they will attend in advance and turn around posts that day. In addition to giving non-attendees the inside scoop they seek, these live blogging posts have built-in amplification. Since the speaker and others following the conference hashtag will share it. Here’s an example by Top Rank’s Ashley Zeckman. This includes photos and videos. One of my personal favorites is photo setups at sponsor booths. While it helps your distribution and amplification if you can turn around your post-conference content quickly. But it’s not a deal breaker if you’ve got big content such as a major roundup post or compiled video. But not everyone does it well! Personally I always try to find a point of distinction as I did with Social Media Marketing World 2018. 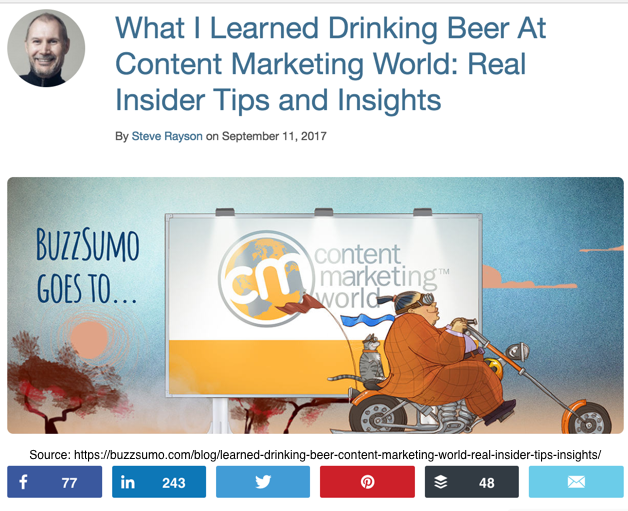 The key to success is a good hook like this post by BuzzSumo’s Steve Rayson from last year’s Content Marketing World. Summarize the key elements of your presentation. Add in new content that was too long to explain and got cut out. Ask a single question of attendees or presenters. This creates a longer piece of crowd pleaser content. You can include photos, audio and/or video. Include conference social media shares. Give presenters and attendees a shout out. While many conferences ask presenters not to share their content publicly since they make it into a paid product, presenters often send a copy of their presentation to attendees. 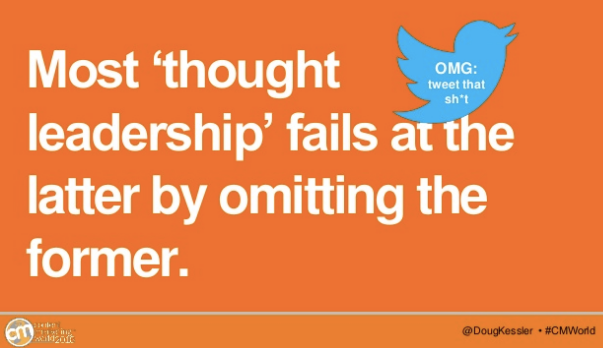 Use this as a way to engage with your attendees after your presentation. 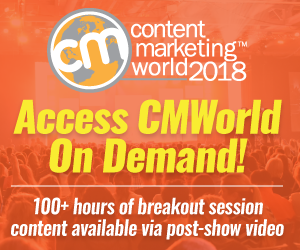 One of the most creative uses I’ve seen was Content Marketing World Track Sponsor, Curata who offered a unique spin. 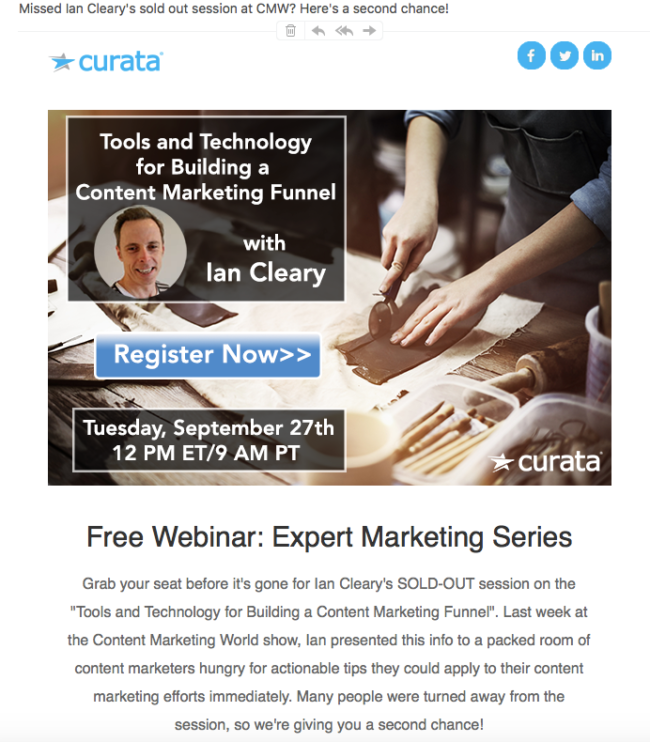 They scheduled a webinar to replay Razor Social’s Ian Cleary’s presentation. It’s a content home run! Use email, social media or even postal mail (to stand out!) to keep building the relationship with people you’ve met at the event. This doesn’t just apply to sponsors and presenters. While many sponsors send a one-size fits all push message, consider a softer approach since not everyone is ready to talk to your sales team. LinkedIn’s Sean Callahan and Jeff Julian excel at capturing video at events and then transforming them into new video content that they drip out during the year. Take a page from Callahan’s playbook and include some fun questions as well as out takes. Note that Callahan also uses pull quotes and ego bait. Orbit Media’s Andy Crestodina is a creative master. 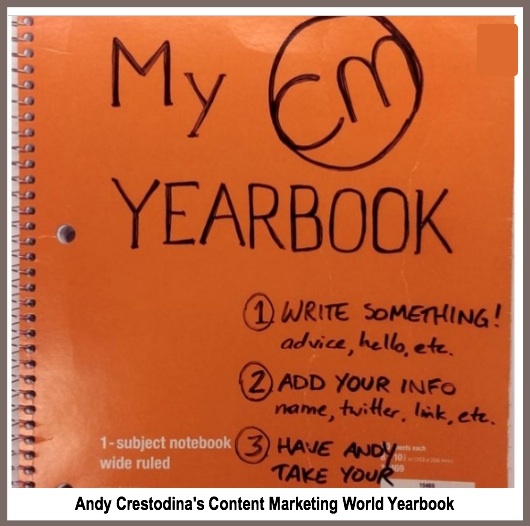 His Content Marketing World Yearbook remains one of the best examples of creating content and getting to know everyone. Conferences create a content goldmine: before, during and after the event. They provide a motherlode of content combined with an audience prepared to learn as much as possible in a short period of time. As a result, content amplification and distribution are close to frictionless. So whether you’re a conference producer, presenter, sponsor, attendee or outsider, develop your content marketing plan to take advantage of this high attention period. Share this article to read with your team since it’s filled with content ideas you can easily apply. Then challenge your team to generate at least 10 ideas in a half-hour and email them to you. Then get together and vet the best ideas (without names attached). Research shows individuals are best at idea generation and groups are best at qualifying the best ones. 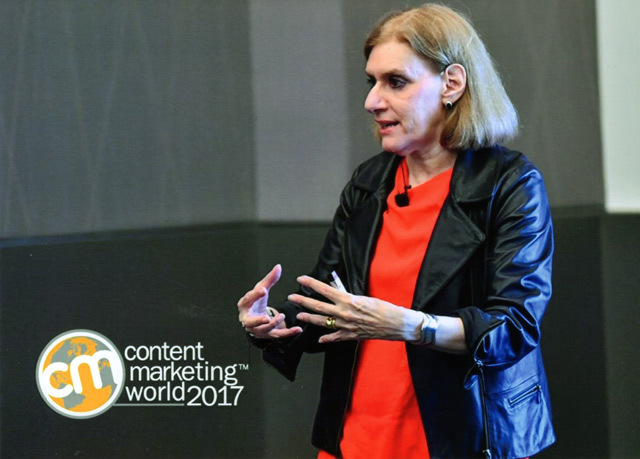 PS: Even if you’re headed to Content Marketing World next week, you’ve still got time to develop some ideas to create content at and after the conference. PPS: Please let me know if you’re attending. I’m presenting at 2:35 on Thursday, September 6th in Room 1. 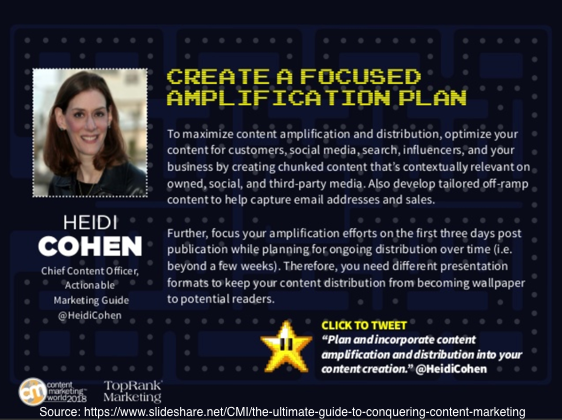 My presentation is called: Secret 3 Steps To Content Amplification and Distribution Success. Note: This article was originally published on September 21, 2016. It has been extensively updated and revised with new content. Tags Allen Gannett, Ashley Zeckman, BuzzSumo, CMWorld, Conference, Ian Cleary, Kelly Kingman, Lee Odden, Nimble, Seth Godin. Bookmark the permalink.